Celebrate Spring with Strawberry Nice-cream! 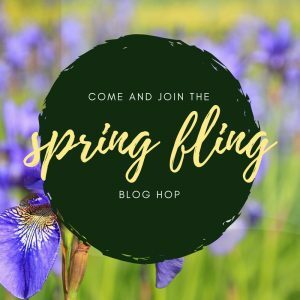 To celebrate the arrival of Spring, I’ve joined some other fabulous authors for a Spring Bling Blog Hop! 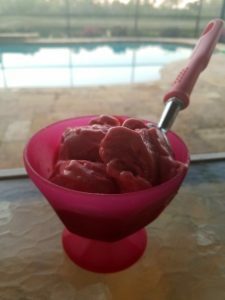 And since it’s strawberry season here in Florida, what better way to celebrate the end to dark, cold winter days then with an easy, healthy, strawberry frozen dessert?! If you’re not familiar with “nice-cream” it’s basically ice cream made with a frozen banana base instead of dairy. So the first and most important step here is to cut up three ripe bananas into small chunks and freeze them. 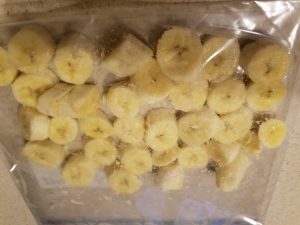 Be sure to lay the bag flat in the freezer so you don’t get one big lump of bananas.Then wash and freeze the strawberries. You will need a Vitamix, Ninja or other high-powered blender. (These frozen banana pieces are tougher than they look.) 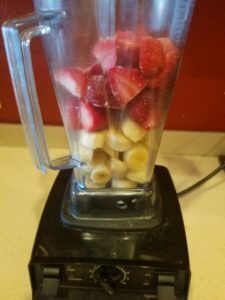 Once frozen, throw them in the blender. Then add the frozen strawberries, 1 tsp vanilla, 2 TSP of coconut or almond milk & blend until smooth! This makes four servings. You can serve immediately (will be very soft) or freeze again for harder consistency. There’s no end to the types of nice-cream you can make! You can add cocoa, mint, chocolate-chips, peanut butter, etc. Experimenting is part of the fun. So, have you tried making your own nice-cream? Any tips or success stories, please share! This entry was posted in Seasons and tagged blog hop, dessert, Shannon Esposito, Spring, Spring Fling, vitamix on 20 March, 2017 by Shannon Esposito. 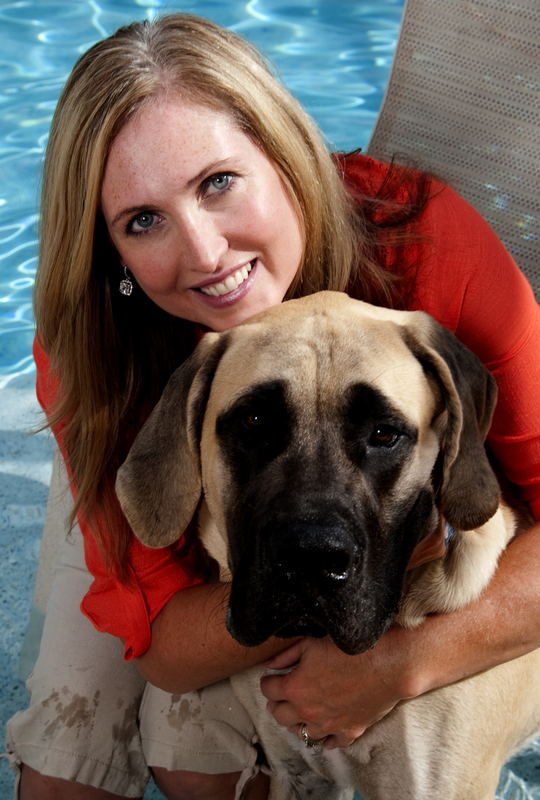 Don’t miss a new book release! Sign up for my Newsletter! Book 3 in the Paws & Pose Series is here! A New Genre, A New Release!